The realistic, informative guidelines in Eat Out, Eat Right enable diners to make healthy menu choices from a wide variety of foods and cuisines, including Mexican, Italian, Chinese, Thai, fast food, and many others. This new edition reflects the latest trends in dining out, with expanded information on &#8220;fast casual&#8221; restaurants like Applebee&#8217;s and Chili&#8217;s; Subway and other sandwich shops; and the myriad of coffee and juice drinks now available. Sample menus, nutritional facts and figures, and diabetic exchanges provide additional information. At first I was a little taken back by this book. From the postings I thought it would include a complete listing of restaurants and their nutrition charts. To my surprise it was "chunked" into different sections - Chinese, Thai, Italian, etc. From here, it went on to explain what's good to eat in each food category along with words to avoid (fried, alfredo, etc). It was helpful since pasta dishes use very different words to describe their food options than Chinese dishes. Another tip I was provided in a seminar was to review the menu before you visit the restaurant. This allows extra time to review the nutritional value of the dishes you are interested in. This has helped me save a lot of calories! Up-to-date, accurate and easy to read! 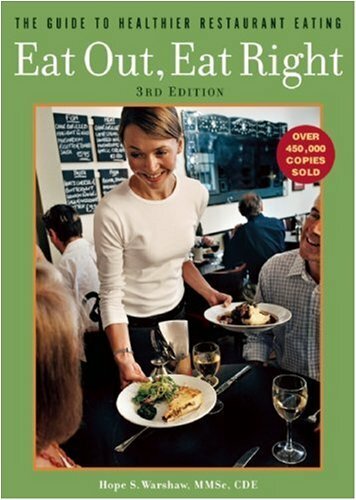 This is a great book to help everyone eat out in a healthy way. The size of the book is easy to carry with you, keep in your car or your breifcase. With this book the challenge of eating out is much easier. Each chapter covers a different cuisine - so makes it useful for a variety of people. I recommend it to my clients as a good reference book. "Eat Out, Eat Right" is a must-have for every person and family on the go. Hope Warshaw, Registered Dietitian, offers sound, practical advice that is easy to understand. This book covers everything you need to know about eating out, from Smoothies to Sushi. As more people dine out more often, it is nice to know that a true nutrition expert has spelled out how to eat out in a healthy way. The "Nutrition Snapshot" meal comparisons and "Special Requests" tips for modifying your food choices are what my clients find most helpful. "Eat Out, Eat Right" is a great resource to keep using each time you eat on the go. It is small enough to fit most anywhere, yet packed with valuable tips and hints. I recommend it to all of my clients, because we all eat on the go. It is worth every penny of its very reasonable price! This is a handy book for anyone who eats out. My favorite part is the suggested meals to order for each type of restaurant (Italian, Mexican, Chinese, Pizza, etc.). The author's tips are practical and straightforward. I like that she makes it possible to eat well when eating out by choosing the right foods, instead of discouraging eating out altogether. My husband loves Mexican food and so that chapter was especially helpful to me in finding healthier foods to order. It was also a good reminder to avoid the chips! I like the Healthy Eating Guidelines at the beginning of the book that can be put into use at home as well as eating out. She includes tips for choosing healthy options for kids as well. With the increase of children eating out on a regular basis, this section is especially helpful. It's a great book full of useful information that I highly recommend to anyone!